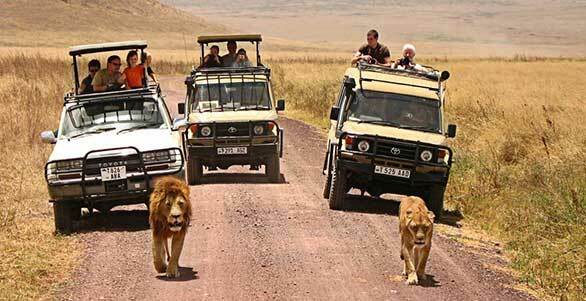 Tanzania safari vacations : Enjoy your holidays ! witness the true wilderness of African soil! Seize the chance to see the best attractions of Tanzania and be able to witness the true wilderness of Africa. Read our articles to benefit from some of the hints to guide you through your Tanzania dream safari. You will often find yourself in a comfortable vehicle offering excellent viewing opportunities, alongside welle trained guides who, speak fluent English language. Take time to book a great safari that suits your budget. Nature, wildlife and safari for your holidays! This Tanzania safari park is among the biggest, oldest and even most preferred game parks within Tanzania. The Ngorongoro Crater is mostly a prime destination in East African safaris due to its broad wildlife packed volcanic crater. Lake Manyara National Park is a famous alkaline lake located in the northern part of Tanzania, learn more about it with us! What about a honeymoon safari? Safaris, whether it's in Tanzania or anywhere else, is more romantic than you might think. Go on a honeymoon safari in Tanzania! A famous vountry situated in East Africa bordering the Indian Ocean, Tanzania is located just below the equator. Rich in breathtaking landscapes, natural wonders and very expanded wildlife, this country will definitely dazzle you once you decide to come by for a safari vacation! Discover immediately our suggestipns of well detalied and well studied itineraries for safari holidays in Tanzania, take a look at the wonderful pictures we've put together for you and take a look at some great activities available throughout the year in every part of this pittoresque natural land!